A joint venture between Lockheed Martin and Boeing has announced plans for a new rocket system. United Launch Alliance (ULA) could slice the costs of pricey space launches in half. On Monday, ULA presented a glimpse of Vulcan — the group’s first in-house rocket design since the two combined forces in 2006 to provide launch services to the US. ULA operations have until now relied on existing Atlas V and Delta IV Heavy rockets. At a press conference this week, though, the firm said it’s working on a mash-up of the two that will be powered by reusable engines. By recycling booster engines — one of the most expensive components involved in rocket launches — ULA hopes to bring costs down to less than $100 million per launch, or less than half of the $225 million spent today. “This is about realizing the true commercial potential of space,” ULA CEO Tony Bruno, a former Lockheed exec, told the Wall Street Journal (WSJ). ULA is currently the sole supplier of rocket launches for the US Department of Defense and its Atlas V rockets have until now been powered with Russian-made RD-180 engines. The Kremlin banned the export of those pieces to the American government last May, however, and the US National Defense Authorization Act for fiscal year 2015 requires those engines to be phased out completely by the end of the decade. To fill the void, ULA is considering BE-4 engines made by Blue Origin, the company owned by Amazon.com founder Jeff Bezos, and engines produced by Rancho Cordova, California-based GenCorp Inc. According to the WSJ, the joint venture will choose between the two by 2017. Already, though, ULA already has an idea of how it’s going to reuse those rockets — or at least the boosters. After a Vulcan rocket is successfully fired, ULA hopes the booster will detach and then float back down to earth within an inflatable heat shield. From there, the engine will be recovered mid-air by a helicopter, in theory. 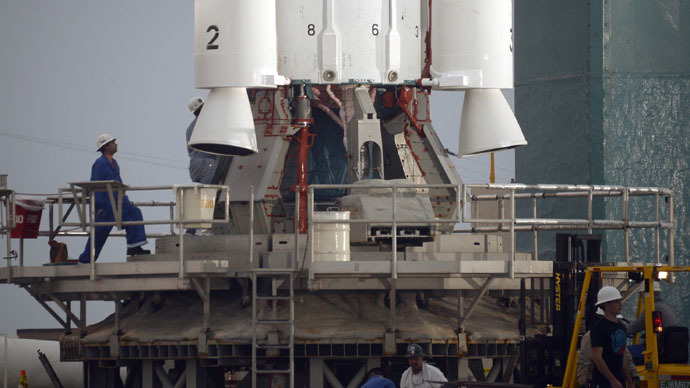 The booster engines, which are the most expensive part of the rocket's first stage, will be reused. Once the booster detaches, it will — protected by an inflatable heat shield — head back to Earth to be snatched out of the air and recovered by a helicopter. Additionally, ULA plans to cut costs even further by landing the first stage of its Falcon 9 on a custom-made barge that will be floating in the Atlantic Ocean. ULA is already developing the booster technology, according to the WSJ, and hopes to have it ready for use in 2023. “Because the Next Generation Launch System will be the highest-performing, most cost-efficient rocket on the market, it will open up new opportunities for the nation’s use of space. Whether it is scientific missions, medical advancements, national security or new economic opportunities for businesses, ULA’s new Vulcan rocket is a game-changer in terms of creating endless possibilities in space,” Bruno said in a statement.